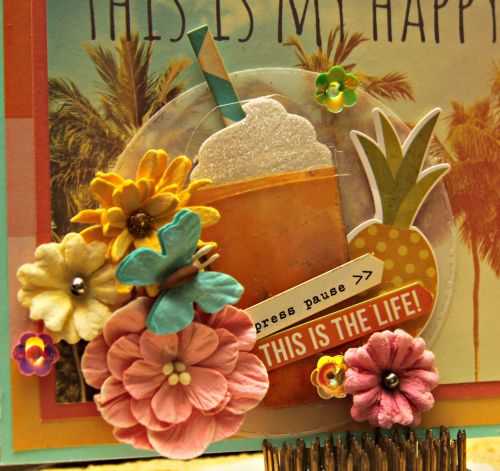 Welcome to the July Inspiration Challenge over at the Paper Sweeties Blog! 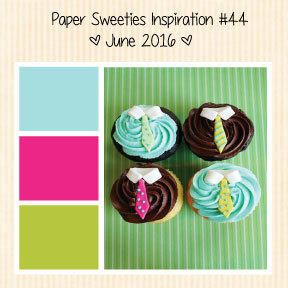 Paper Sweeties Inspiration Challenge | July 2016! My favorite youngest son's birthday is on the 3rd of July. So many red, white and blue birthday parties for him! And many times he even got fireworks for his birthday! So when I saw this inspiration challenge I decided to make a birthday card for him. 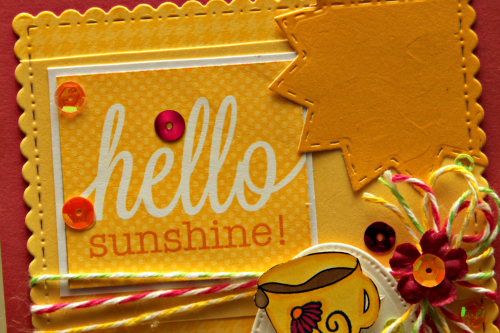 My design is similar to one for last month's release but this time I used the Be Happy Sweet Cuts for the sentiment banner and the coordinating Hello Friend stamp set. 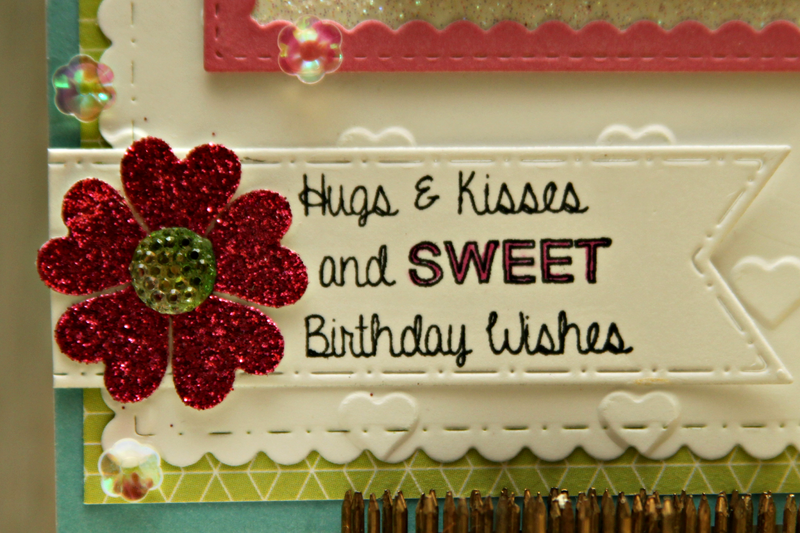 I just love those two sets together for a grand sentiment! Then exploding out of the banner are some fireworks from the June Release I Love Summer Stamp Set and Sweet Cuts and my all time favorite squigglies from the Sweet Borders Sweet Cuts. My stars were cut out of white glitter paper using the star from the I Love Summer Sweet Cuts for the smaller one and the smallest of the starts from the Be Happy Sweet Cuts for the bigger star and of course some Sugar Sprinkles Sequins.. my favorites because they go with anything! I added some stickles to the fireworks for some extra sparkle. 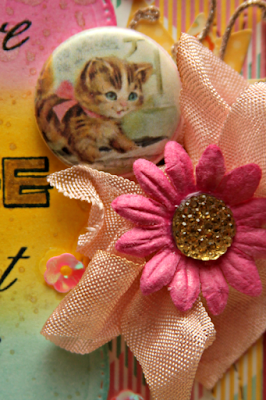 I'm also playing along with the Anything Goes Challenge over at Crafting by Designs! Thanks so much for stopping by! 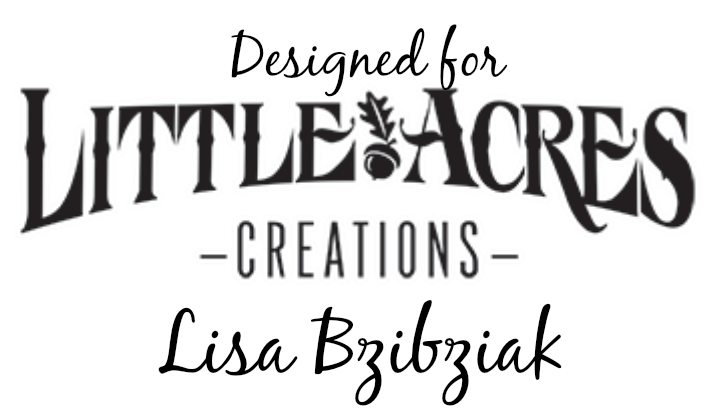 And don't forget to check out all of the fantastic creations the rest of the Design Team has cooked up for you! Quick post this morning! I needed a sweet birthday card and Paper Sweeties June Inspiration Photo immediately came to mind... my favorite colors!!! 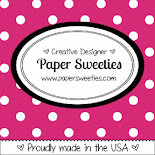 There is still time to play along and maybe win some Paper Sweeties goodies! What inspires you in this photo?? Obviously mine was the colors and the thought of yummy frosting!...lol. Of course I used my favorite heart banners from Sweet Borders Sweet Cuts as well as the sentiment banner and the cake from Party Time Stamp Set. And I used the extra center heart cutouts from the banners to create my sparkly flower! You've got nothing to lose! Come and play here! Welcome to this week's Atlantic Hearts Sketch Challenge!! So... does everyone else have to scramble every time they have to make a man card? I just really need to be better about making some ahead of time... this one is for my husband. His birthday is today! Luckily he's out of town and is coming home today so this will be waiting for him when he gets home. 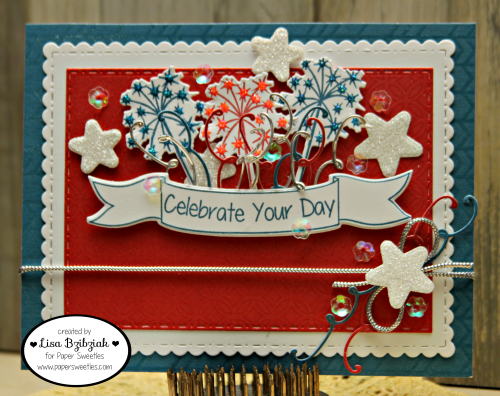 I'm also playing along with the Between The Folds Birthday Challenge #24A! I used the wood grain from the Happy Times paper packet for the bottom and embossed some gears and cogs on the ... I have to be honest... it was a long week at Convention in Florida... I had one hour of sleep on Saturday night and had to catch the bus to the airport at 3:15 am which meant getting up at 2:45.... anywho... I have no idea what color that green is... might be Lagoon... but I'm just not sure because it looks a little different from the smaller piece behind the sentiment which is Lagoon. Might be twilight (retired)... I'm really not sure. But I felt it went along just fine especially after I rubbed some whisper all over it! I'm kinda proud of myself because my goal in the coming week is going to be to use up some of these extra cuts that are laying around from past projects... all of the frame cuts here are from those extra cuts. And that sentiment is from an old old CTMH stamp set, Birthday Funnies... I decided I'd go funny instead of mushy since he seems to get a kick out of calling me old since I'm a little over a year older than him. 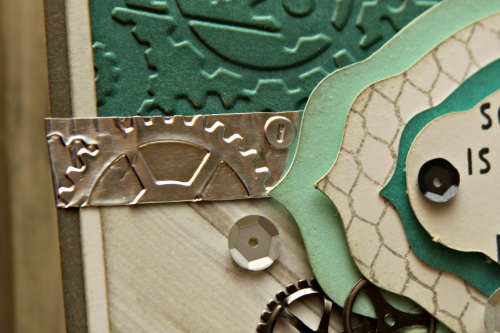 I cut the word "Totally" using last month's CDD Release, Greeting Word Dies and I found the little gears and cogs in my stash. 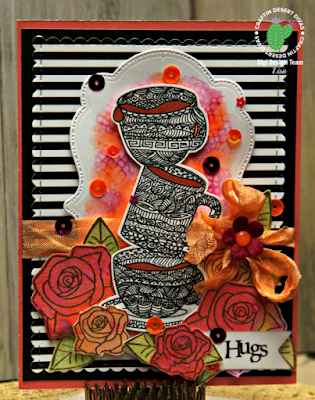 I used the chicken wire background stamp from one of my old favorite CTMH stamps, Distressed Backgrounds. It's one of those that I go back to quite often. A few CTMH self adhesive sequins and I was done. Cool note.... quite some time ago, my friend Mitra... you know her... I've talked about her often and you can find her blog here.... told me that she likes to buy the metal tape that's used for say heating duct and you can do so many things with it. 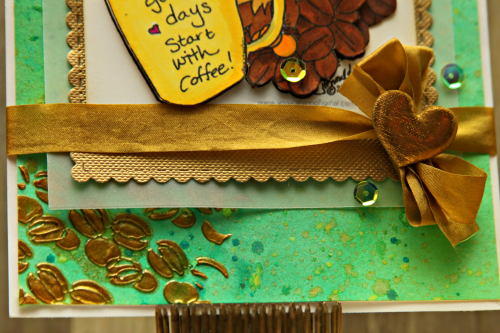 Like here, I embossed a strip of it and then cut it down and used it kind of like man ribbon... I LOVE it! Thanks Mitra! So thanks for stopping again... it's going to be getting crazy around here again next week so please do come back from some exciting news and lots of (hopefully) cool projects! 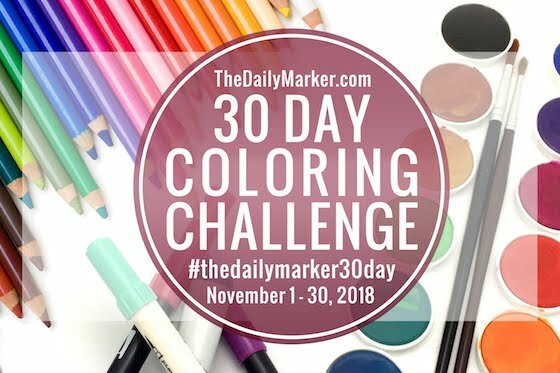 And head on over to the Atlantic Hearts Blog and check out this week's sketch, and also challenge participants and design team work as well! (This week's Design Team projects will post with links on Wednesday... but you can see past weeks' sketch challenge artwork anytime! Also, Michelle has put out a call for Design Team members! If Michelle's sketches inspire You, you can use them to inspire others! Although I play along every week, the commitment is really only for every other week ... you can fit that in! It's a fun opportunity to get motivated and meet some great new people! You CAN do it!! 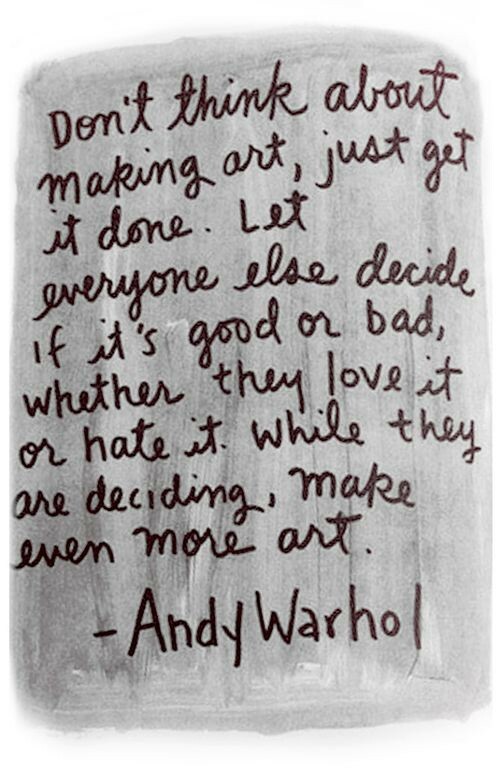 And you ARE creative!! Stop fooling yourself... check it out on the Atlantic Hearts Sketch Challenge blog! So this is the end for me folks! 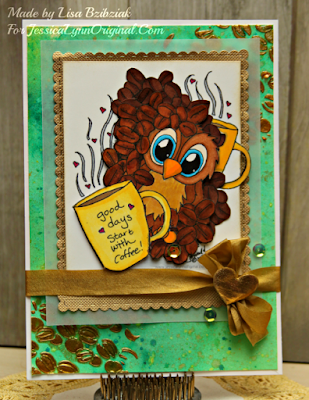 'Til we meet again for the Fall Coffee Lovers Blog Hop. But only a few hours left for the Summer Hop! 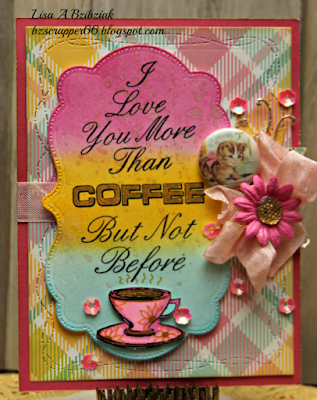 (Although really that is enough time for one more card... not for me because at this time I am not near my craftroom! ). Over the next couple days I'll be shopping some of the awesome sales our sponsors have cooked up and consulting with the list I've been keeping... I'll be commenting to try to keep up.... and then back to reality. I really hope you aren't strangers after this! Visit me and I'll visit you back for sure! It was really kind of fun and therapeutic to create this.. just sitting and doodling... 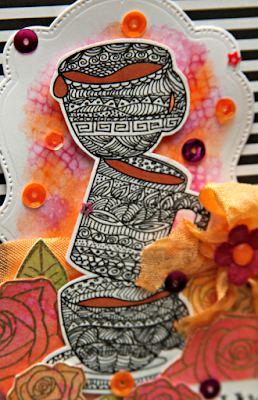 I told you I was going to have something different for you with this Tipsy Cups digi image from Craftin Desert Divas. I decided to try a little Zentangle. Mine is not fantastic by any means. You can search on Pinterest for Zentangle and there are some wonderful patterns and instructions on how to create them. I plan on revisiting this when I have more time and giving it another go... but for this little image I printed out I'd say I didn't do too terribly awful either. 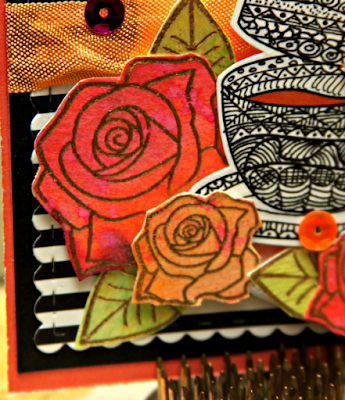 And I finally got a chance to use these beautiful roses from the fantastic Flowers in Bloom Stamp Set. I embossed them on some watercolor paper and I love the way they turned out... as well as the leaves! Sad Day... Last Day of the Coffee Hop... Now What??? We are on the last day of the Coffee Lovers Hop! Oh Whoa is Me!! I am so sad and really just don't know what I'm going to do with myself... oh yeah... that's right... I'll have a whole day of commenting to finish up...lol! I decided for today to introduce you to Craftin Desert Divas "Tipsy Cups" digital image. I love this image because it's plain and simple some tipsy cups that you can decorate however you please. The cups are plain and I used various CDD stamps to decorate them with flowers (Build a Scene 2 for the coneflowers and Home Sweet Home I believe for the daisy like flower). They are just the sweetest! I printed out a whole bunch in different sizes so I'm sorry, but you'll have to be seeing these probably a few more times after the hop..lol! 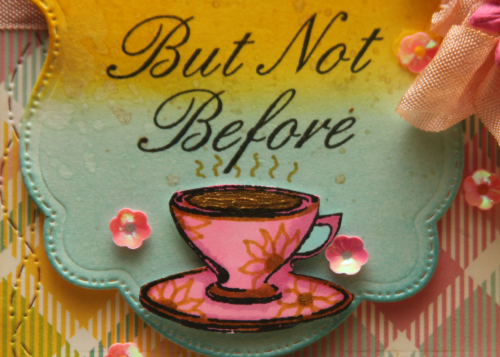 And Doodlebug also has some really cute little titles and sayings in their paper pads .. and this one was perfect! I used The Sky Is The Limit dies for the sun! 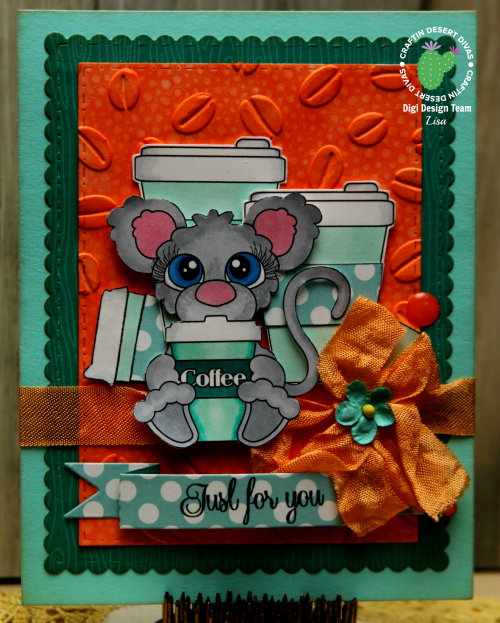 Back again with another Coffee Card for the Summer 2016 Coffee Lovers Bloghop! My good friend Patti made one of these when we were at a crop together and I've been wanting to try it since! She found something on Pinterest and then kind of winged it and when I started creating mine, I checked in with her and then I winged it too. Basically she had me cut a bunch of rectangles that were about 1.5 inches wide and 4.5 inches long. Then I cut them each from one corner to the other corner and proceeded to place the rectangles in a starburst pattern where I thought I wanted them on my paper before I decided it was time to glue them down. That's it. Nothing too scientific and there may be a better way to do it, but THAT is what I did. 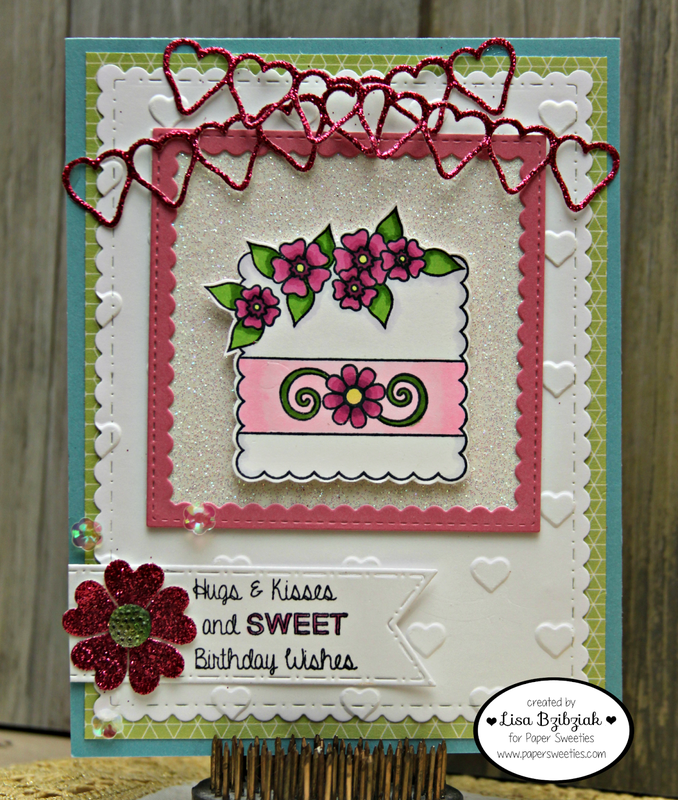 Where they came together is where I first placed my border across the bottom and then slapped on my beautiful Paper Sweeties heart doily from the With Love Sweet Cuts. 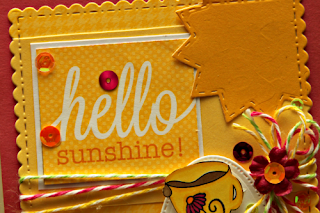 You can make this Sunburst design without the border and have the rays go all around, but I chose to make mine this way. There are tons of links on Pinterest where I'm sure you could find tutorials... I'll call my version "Winging It". These very cool coffee stamps are from Stamplorations and I'm also playing along with the Stamplorations Never Ending Anything Goes Challenge! 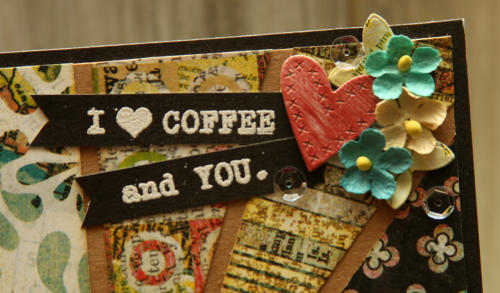 I just love all the sentiments on the Coffee Happy Set... and I love the look of a white sentiment embossed on black paper... and I got these cute little paper flowers at my LSS and cut the little leaves with a Paper Sweeties die from Hello Spring set. The little cross-stitched heart ... I borrowed a die from mom and I don't remember where it was from... but I can find out if you would like to know. So thanks for stopping by! 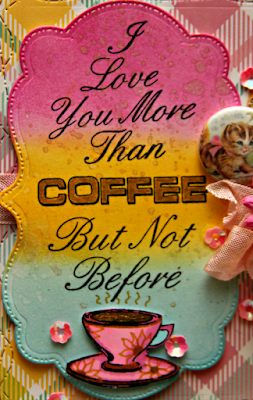 You still have today and tomorrow to link up to the Coffee Lovers Hop! Come on! Throw your cup in the ring!! Nothing to lose and everything to win! Oh... I almost forgot... #AMYMADEMEBUYIT ! Coffee Hop.. Star Date 6... three days left???!!!! So Regina Easter, the oh so wonderful owner of The Cutting Cafe' and The Cutting Cafe Shop has a plan. And this plan involves sometime, in the fairly near future, offering custom made stamps. So she asked each of us on the Stamp Design Team to make a request. With the Coffee Hop right around the corner... my mind was on coffee... oh heck.. that's nothing new. So this is what I requested! I had seen versions of this saying around on Pinterest but since it was for me... custom... I tweaked it a bit. Before I go further... I will tell you that the paper is from the Echo Park Spring 6x6 paper pad.. yes! I know this is the summer hop!! 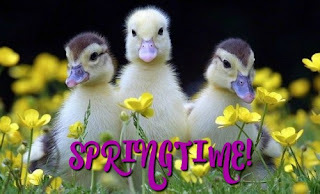 But the colors are right and really Spring here in the southwest AZ area is much like Summer anyway... so... I used it. Don't you judge me! So here it is closer up... what I love about my set is that the I Love You More Than and the But Not Before are separate... so I can just use the first and be Sweet or use them together and be Sassy! Usually I choose Sassy... but really you never know. And then I chose three words that I could insert, one of them being Coffee and ... well... you'll just have to wait to see the other two. I love that coffee is in the block lettering that I can color however I want... it's just the outline... so many possibilities. And then I can either use the words in both spots or like here I can substitute with a little image. For the background on my label I used Tim Holtz Distress Inks and I have to say thank you to SonjaK for the great video and you can watch it here if you'd like on how to make this background. She was my inspiration for this. I didn't do all of the distressing she did and I'm no expert for sure, but she did clear a couple things up for me and I think I'll get better at it. I sponged on the colors and then sprayed with some gold color shine. I sponged off the excess and it helped because there was no curling of the paper and less wait time to dry. See .. the above is Sweet! But with the below... Sassy! 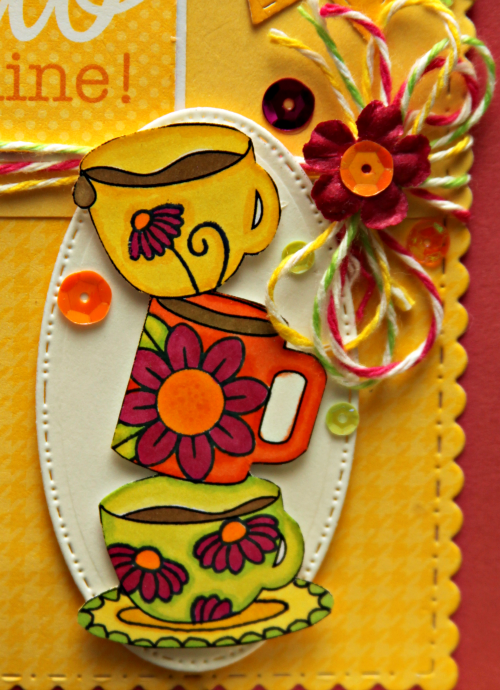 I stamped this little cup and colored it pink and then added some hand drawn flowers with gold wink of stella... I thought it might give it china cup kind of feel... but don't mistake this for tea.. it's definitely coffee in there. And did you see this adorable little kitty badge button?? I got this from Lori at ChouxChoux Paper Art's Etsy shop... these are the most adorable little kitties and I chose the colors of this card so I could use one of these on it...lol... so sweet! And she makes these!!! Made in the USA people!!! They are awesome! 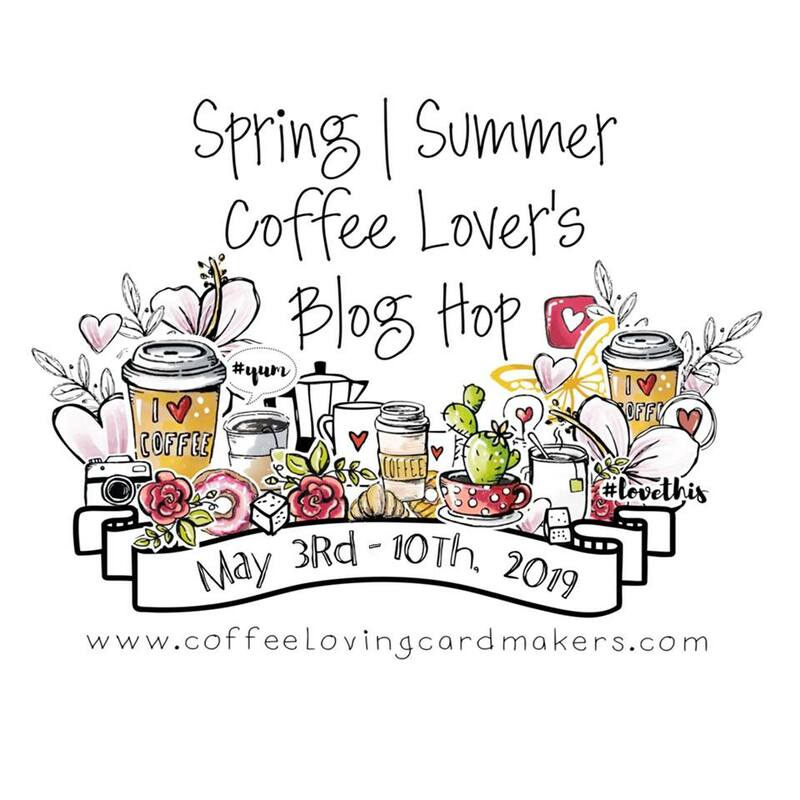 Welcome to Day 5 of the Summer Coffee Lovers Blog Hop! 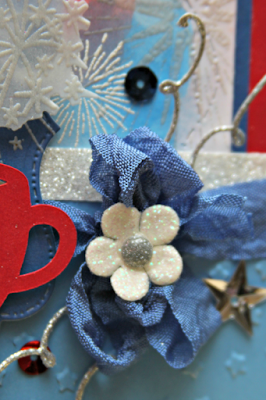 Link up your new Coffee, Tea, or Cocoa creation and you could win some awesome prizes! Craftin Desert Divas is one of the Super Sponsors and is offering a $25 gift certificate and also you can get an adorable free digi download (link is below) while the hop is running! This month's Digi Challenge over in the Facebook Gallery is all about Coffee too so you can enter both challenges! Everyone who plays along with the CDD Digi Challenge gets a free digi the following month! Everyone's a winner! 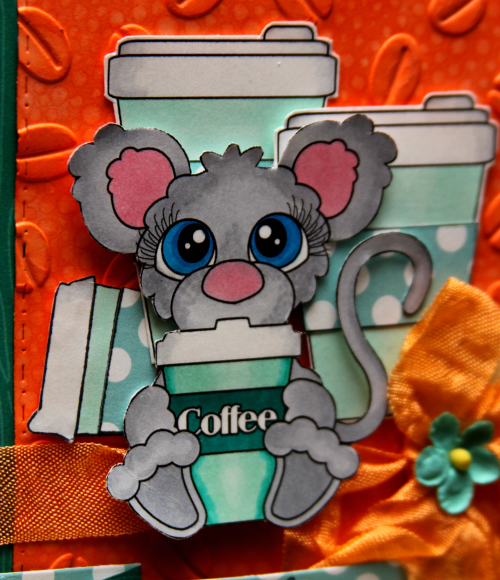 This is just one of the adorable digis available over at Craftin Desert Divas! 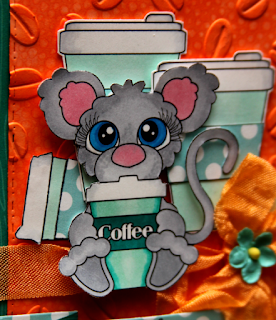 I just love this Coffee Mouse digi... by himself he's just the Mouse and Coffee cup he's holding. Then I used the Coffee Couple digi and printed a couple more cups... colored them and covered up the faces with some paper and strategic placement of Mr. Mouse's ears. I also used the cup from the Got Coffee clear stamp set for the smaller cup (I could have just printed another set of the Coffee Couple smaller, but I had the set so I used it!). It's hard to see in these pics, but I only needed part of the cup to stick out so I stuck the top half on the left and placed the bottom half on the other side at a different angle so it looks like he's on his fifth cup! The sentiment is from the Simply Said clear stamp set and that awesome pop up banner is from the Flag Banner Die set. And well... of course I used Fancy Frames for the background layers. Isn't he just sooooo cute! I think his eyes are my favorite! 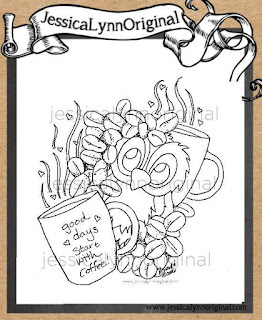 AND... don't forget to download the freebie Tara is offering, Coffee Friends digital stamp and play along! Thanks for stopping again today and I'll be back tomorrow for sure! I'll be over to your place soon! 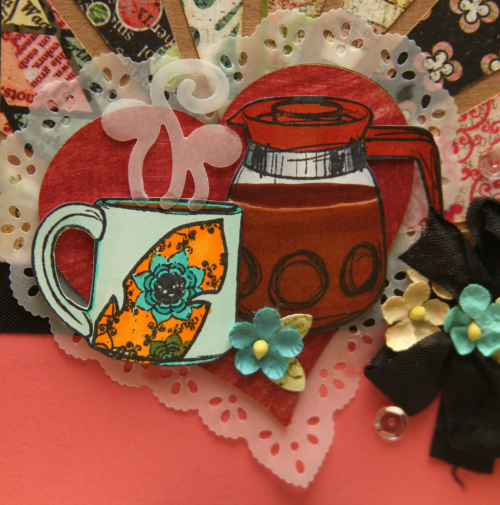 Atlantic Hearts Sketch Challenge #165 Plus Coffee! 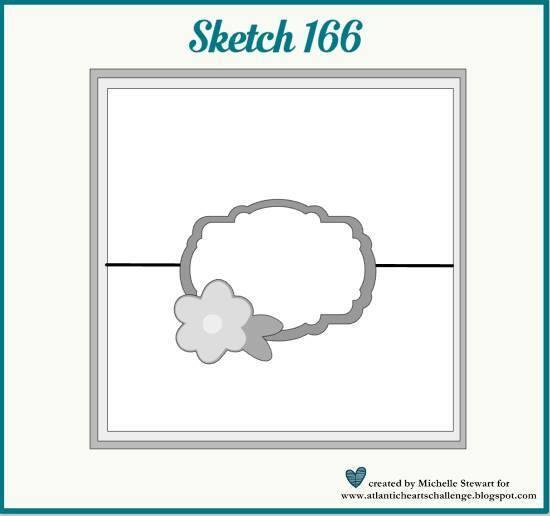 Welcome to Atlantic Hearts Sketch Challenge #165! Michelle has given us another great sketch to work with.. thank you Michelle!! 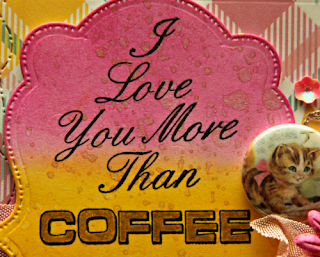 As you may or may not know... the Coffee Lovers Bloghop is going on. 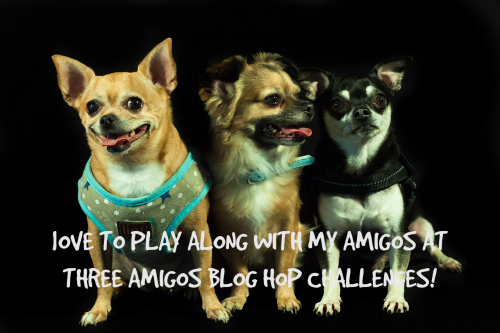 A week long celebration of all hot beverages and bloggy friendships. It happens four times a year and this week is the Summer edition. I decided to incorporate some caffeine with my Atlantic Hearts! I used a very old CTMH set here and some other really cool stuff. For one thing... check out my Crazy Stitched Frame from Craftin Desert Divas (Super Sponsor-Free Digi Offered For the Hop)! For the background I was inspired by one of my PS Design Teammates to watercolor some red and blue... mine didn't turn out nearly as lovely as hers did, but it's all right. You can see Mackie's here and I suggest you wait 'til I'm done with you because you won't want to come back! 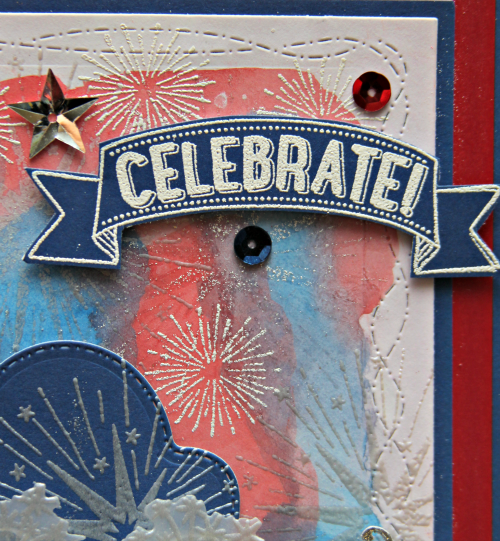 Then I used the old Stamp of the Month, Kaboom and embossed some fireworks in silver pearl, white, and holographic powders. That banner/sentiment is from the stamp set also. I embossed that in white and cut it out. And notice those pretty sequins! 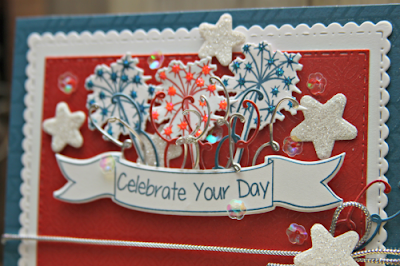 Those are Freedom Sequins from CDD, a cool mix of silver, blue and red... love the silver stars! They are so dimensional! 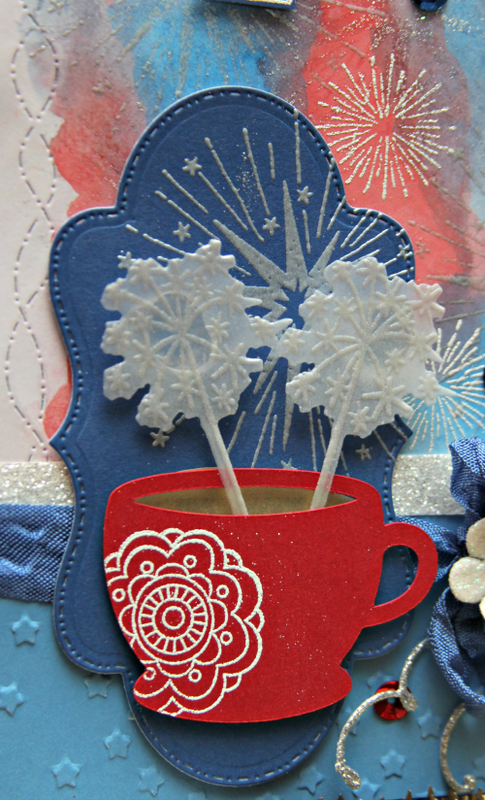 I used CDD's Fancy Stitced Label Dies to frame my cup and embossed one more firework on it. Then I cut this cup from the CTMH Artistry Cricut Cartridge. The cut has whipped topping, but I detached the image and didn't print the topping because I had a plan. I popped up the cup.. no whipped topping left a hole in the cup which worked out great. I placed a piece of gold vellum behind the hole, but didn't attach it to the cup so the color was there, but I could still place my firework steam inside the cup. 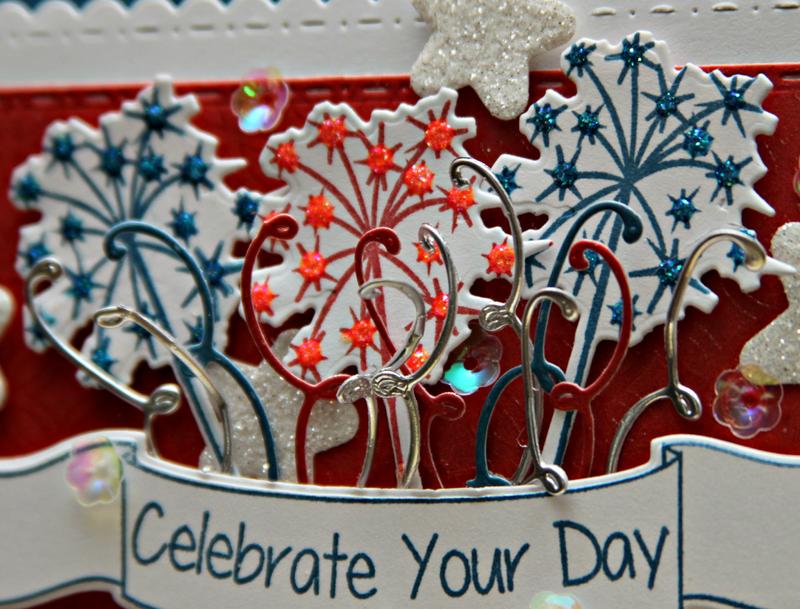 Then I embossed the sparkler/firework/dandelion stamp from Paper Sweeties June Release, I Love Summer (Super Sponsor-Sale going on!) and used the die to cut it out. It was the perfect size AND it had the die to cut out the fireworks so it was perfect. I used two dimensional glue dots to keep them popped up. I don't know how relaxing a cup of coffee with firework steam is... but it's certain to get you moving. OH! Almost forgot... before I attached the cup, I stamped and embossed one of the images from the CTMH Ornate Blossoms stamp set on it. My friend, Karen Kondrick is the CTMH Super Sponsor for this hop and you can check out her coffee creation here! She's giving out a prize for the hop... be sure to let her know you stopped by! Diana Larson from D.L. Art, Super Sponsor, had a sale on ribbon last week (and there is a new sale going on now). This blue is from her new rainbow collection. It had some colors in it that I didn't already have and this blue ended up being perfect for this card! I also got a few really pretty variegated ribbons which I'm sure you'll be seeing. Check her out! In fact, I'm playing along with her Thankful Thursday Challenge #182 Red White and Blue! So! Get to work and head on over to Atlantic Hearts... check out some of the artwork... play along! 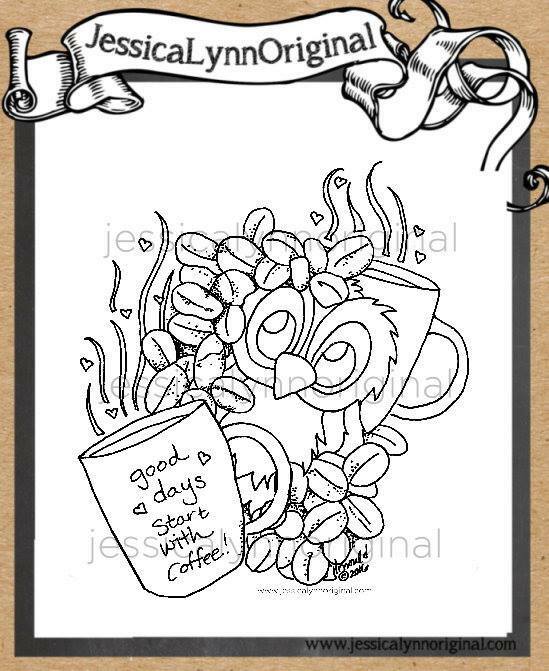 Make a coffee card... play along with the Coffee Lovers Challenge at the same time... lots of possible coffee cards to be made with this sketch! Win some prizes.. win some bragging rights... have some fun... meet some new people! Oh hey! Don't forget to come back tomorrow! My Happy Place-Thank You To Simple Stories and Petaloo! So a couple weeks ago I entered a drawing to win some awesome stuff when Petaloo and Simple Stories teamed up. And much to my surprise, I won!! How exciting... I mean both companies make such awesome stuff! 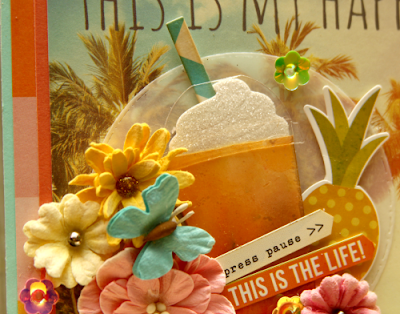 Yesterday evening I went to my mailbox and there it was... this beautiful tropical You Are Here paper pack that includes all kinds of coordinating items .. paper, stickers (which include cute little images, phrases and letters), not to mention little PML cards and more. AND a whole bunch of packages of flowers and ribbon from Petaloo. 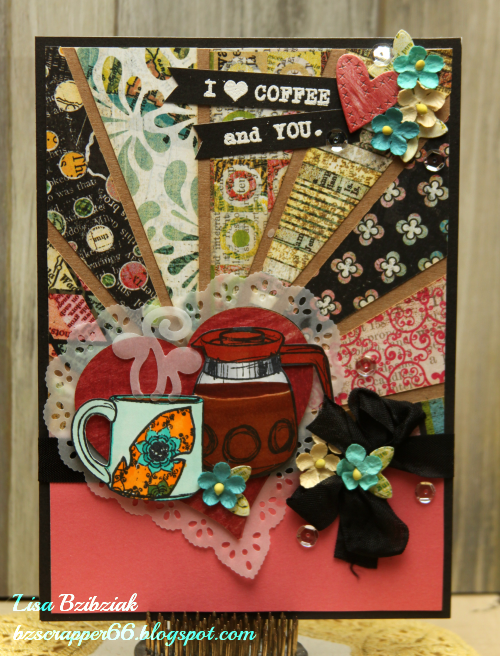 I was trying to figure out how I'd get a good picture of it all to say thank you, however then I decided better to actually make something with it so I decided to squeeze in another coffee card today (really I'm supposed to be cleaning...but hey! 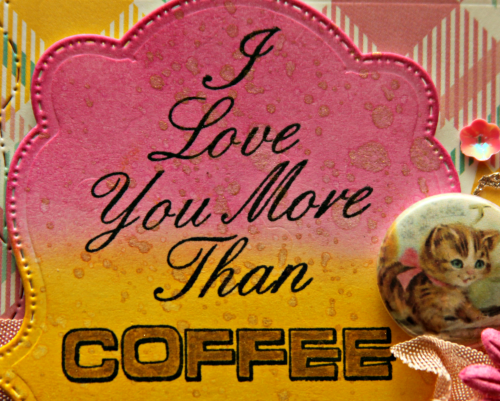 It's Coffee Lovers Bloghop week and even my husband is starting to realize what that means! 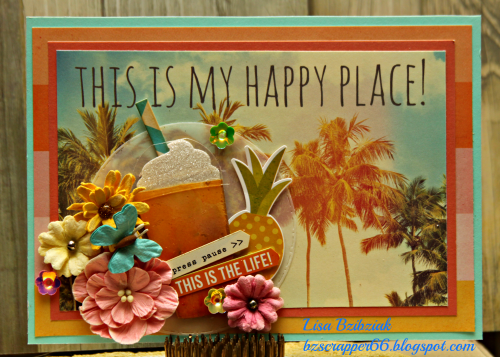 The background above was one of the around postcard sized images included in the pack as well as the striped paper behind it.. and the saying was already on it... and since that's true for tropical vacation, coffee, and my craft room I decided it was perfect... In fact... this may become part of said room. I just got this awesome Coffee To Go Cup die this week from SugarPea Designs (one of the Super Sponsors for the hop)... #amymademebuyit ... just in time for the hop... but with all of the ideas I had I didn't know if I'd get a chance to use this one for this hop. It was unavailable for a long time and when it was finally back in stock I snatched it up. I like to be able to cut one without having to fire up the computer and Cricut every time and something I can be mobile with. It is awesome! AND I was able to use some packaging to cut the cup and top from. The same clear plastic I've been punching out little circles to use as embellishments. I just ran it through 3 or 4 times and it worked great! I cut the cup out a second time using some watercolored paper I've had laying around... it was the perfect color for a carmel frappuchino! Don't know if you noticed, but I cut the top at an angle since I knew my cup would be at an angle. Then I cut my whipped topping out of glitter paper and used one of the Simple Stories zip strips to cut out the straw. I added a vellum circle diecut with my CDD Stitched Circle dies because I didn't want to completely cover up the background paper since it's so beautiful and I like the effect. I popped the cup up on the vellum. Then it was just adding the already gorgeous Petaloo paper flowers that coordinate perfectly with this tropical paper. Check out that paper butterfly too! I just LOVE Petaloo's gorgeous flowers... nothing to do... just take them out of the package and throw them on.. easy and beautiful. 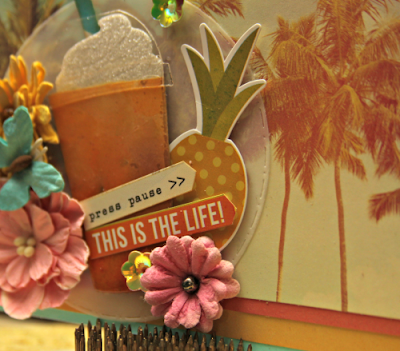 I also used a few stickers for the pineapple and the two sentiment tags and sprinkled on a few CDD large flower sequins... these suckers are big and the colors were perfect for this card. Thanks for stopping again today for this unexpected addition to my Coffee Lovin' projects. Come back tomorrow for Atlantic Hearts! Things will be "Poppin' and Crackin'" around here! Now... to get back to that housework! or... maybe one more card :) And if you haven't yet... be sure to check out the Coffee Lovers Hop!! And play along! Don't tell me you don't have any coffee stuff... some of the sponsors are giving away free digis! Get over there! Lots of prizes... you will not regret it! And thank you Cheryl Cohen from Petaloo and thank you Simple Stories for the awesome prizes. And thank you Sugar Pea Designs for sponsoring the hop. And thank you Amy Tsuruta for putting on another awesomely fun hop! 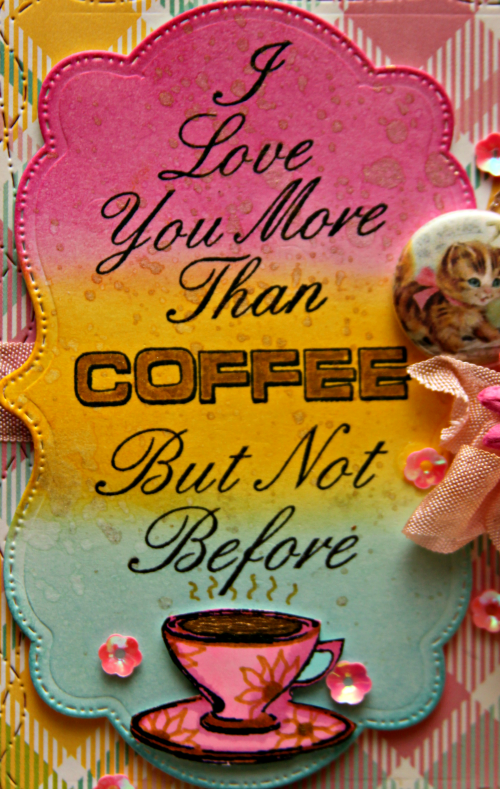 Welcome to Day 3 of the Summer Coffee Lovers Bloghop! Create a new Coffee, Tea or Hot Cocoa project and link up to the hop for a chance to win! 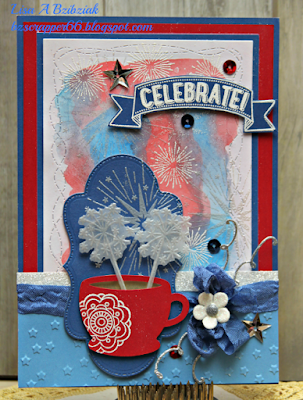 AND you can download the awesome digital rubber stamp that I used to create today's card here for free! I just LOVE this digi that Jessica is offering up during the hop as a free download!! (You know how I feel about owls and Brentwood is just... such a cutie and he's so much fun!) I printed him twice and added a second layer of coffee beans... If you've never met Brentwood before you must check out the shop over at JessicaLynnOriginal.com There is a whole collection of Brentwood clear stamps and they are ADORABLE!! 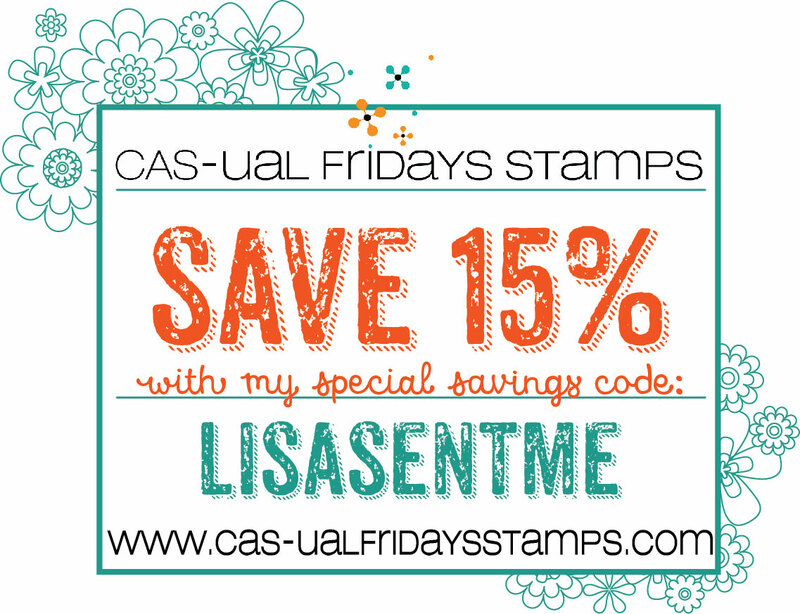 Not to mention tons of other fantastic stamps AND she also creates custom stamps and more! For the background I used some watercolors in various shades of green and then splattered on some more green and of course sprayed on some gold Color Shine! I added gold texture paste coffee beans with a stencil. These colors make me feel like Summer! The pretty green grass and the yellow sun and some people's golden skin...lol... although my skin remains a bit pasty usually; in part because I'm inside making cards a lot while it's 120 out and also when I am out... sunscreen, sunscreen, sunscreen! Thanks so much for stopping by and don't forget to visit Jessica's Shop! Download your free digi and play along this week! There is plenty of time! I'm also playing along with the Classic Design Team Open Challenge #03, Anything Goes! See you again tomorrow and I'll be visiting you too! 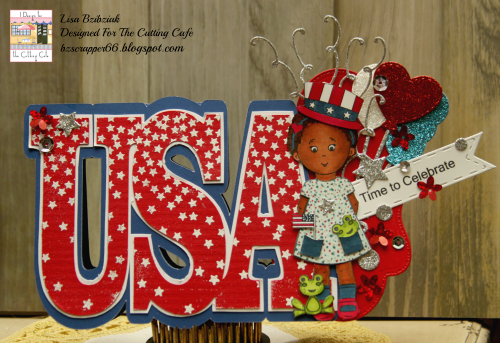 For this card I used the USA Word Shaped Card Template to cut out this cute card base. I changed it up a bit and made a third layer by cutting out an extra base piece in white, adhering the red to the white and then cutting around it with my scissors. I probably could have just resized one of the layers, but I had already cut my pieces and didn't want to re-cut or waste what I had. Then I stamped some stars with Versamark and heat embossed the top red layer with white embossing powder. 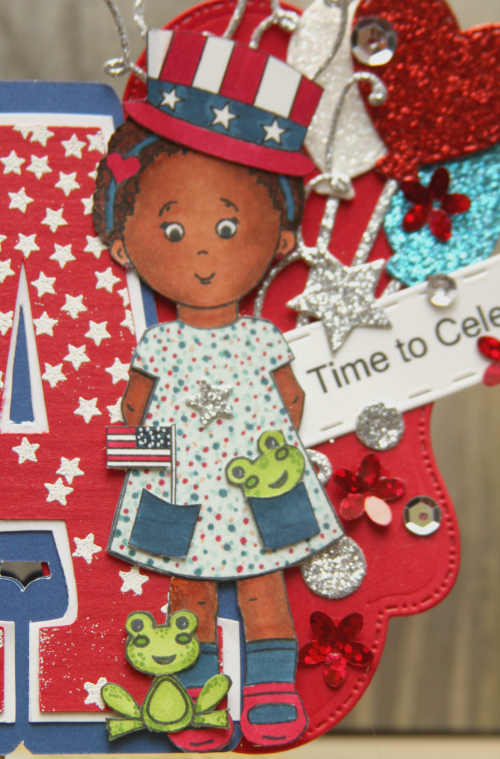 I used a label die to extend the card out a bit so I could have a little bit more room for decorating without covering up the USA. I stamped Ruby J from the Everyday Elisha Jean and Friends clear stamp set from the Cutting Cafe Shop, colored her with my Copics and cut her out. 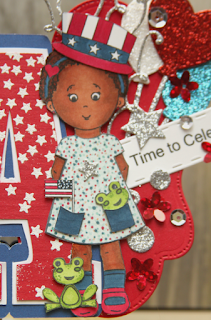 I used the Ready for the 4th of July Elisha Jean & Friends printable stamps for the Hat, Flag sticking out of her pocket and the sentiment. I added a few more things from my stash and she is ready to Celebrate! 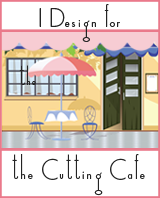 Please be sure to check out the Cutting Cafe Blog on the 21st where you'll find links to all of the Design Team's awesome makes! You can stop before and check out a lot of great projects from prior team projects, but make sure to come back on 21st if you love all things Red White and Blue! 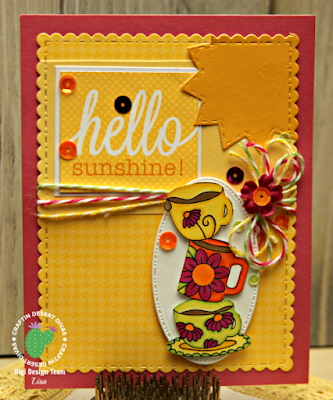 I'm also playing along with Sweet Stampin' Challenge "Show Us Your Shapes"! Create anything that isn't a square or rectangle. Check it out! Thanks so much for stopping by today and please do come back again. The Coffee Lovers Hop is going on all week and I'll be sharing some Cutting Cafe awesomeness again this week! 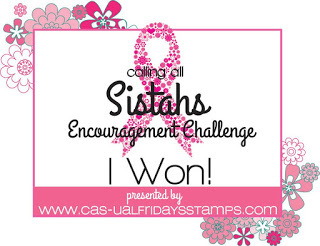 Inkspirational Challenge and More Coffee Lovin'! 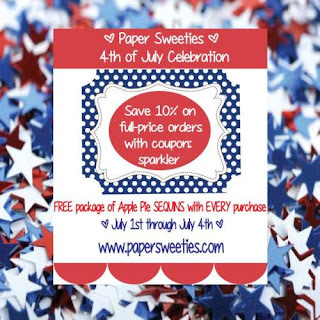 Paper Sweeties June 2016 Release Rewind! Paper Sweeties June 2016 Release Party! 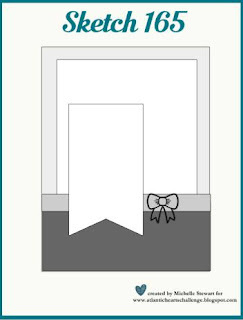 Paper Sweeties June 2016 Release Sneak Peeks!